New patients often remark on how ‘beautiful’ and ‘relaxing’ our office is. We’re pleased, because our goal is to offer you the best chiropractic care in a comfortable surrounding. You should set aside approximately an hour for your first appointment. 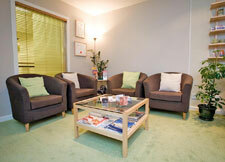 When you come into the office one of our clinic assistants, Marlene or Marie, will be here to greet you. They will guide you through some of the paperwork we need you to complete before your chiropractic consultation. This usually takes ten to fifteen minutes to complete, and gives us your basic details and some information regarding your or your child’s current and previous health history. Then, during your consultation, I will ask you a few questions and do a lot of listening. This not only allows us to get to know each other, it also gives us the opportunity to discuss your unique health goals, relieve any concerns you have and establish if chiropractic is likely to help you. If it looks promising, we will then continue with a thorough examination, so we can identify the cause of your problem. If after your examination specialist imaging is needed, for example an X-ray, we will arrange this for you quickly and directly with the medical imaging department at the Gilbert Bain Hospital.